This dish is quick and easy but full of flavour. 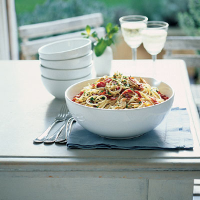 Use chopped sun-dried tomatoes or cooked fresh or frozen peas or broad beans instead of the artichokes, if you prefer. Cook the pasta in a large pan of boiling water for 8-10 minutes. Meanwhile, roughly chop the bacon, heat 2 tablespoons of the reserved artichoke oil in a frying pan and fry the bacon for 3-4 minutes, until crisp. Add the garlic then remove from the heat. Drain the pasta, return to the pan and stir in the bacon, artichokes and parsley. Season. Serve sprinkled with the Parmigiano Reggiano, if using. Use Waitrose Marinated & Grilled Artichoke Hearts (from the prepacked deli section) as an alternative to the Waitrose Cooks' Ingredients artichokes.